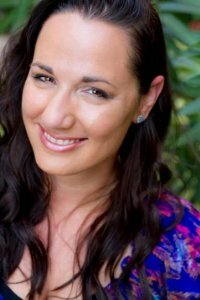 Chances are you've read at least one book by The New York Times and USA Today bestselling author Jennifer Armentrout at some point in the last few years. Why? Well to put it simply, she's an extremely talented, book-writing machine. Since 2010, Jennifer has written over 28 books, including the Covenant series, Lux series, Gamble Brothers series, Wait for You series and Dark Elements series (just to name of few) - many of which have rocketed to the top of the sales charts and become the obsession of readers across the globe. With all the buzz surrounding her books, it's no surprise that Hollywood eventually came knocking. Her young adult Covenant series has already been optioned for TV, and the movie rights have been sold for Obsidian -- a book that almost didn't happen. "It kind of started off as a joke," Jen explains. "My editor came to me and said, 'Since you write so fast, would you ever want to write a story about aliens in high school?' And I laughed and said, No.' But the more I thought about it, I realized there hasn't really been a love story recently about aliens in high school. So then I started writing about this girl who moves to a new town and I created Kat's character and then Daemon's character, and the whole thing kind of came from there." Jennifer has truly carved her own path in the publishing industry as a "hybrid" author - so to speak - self-publishing books, working with small presses, and of course nailing deals at huge pub houses. "One thing that I try to stress to people is there is no one way or no right way to do this," she says. "You can make your own way. It's about getting out there and not letting rejection get you down." Chatting with Jennifer was truly a good time. She was really funny and extremely nice, but more than anything I was so impressed by her determination and strength, especially given the fact she's been diagnosed with Retinitis pigmentosa -- an eye disease that damages the retina and often leads to blindness. "I think a lot of me writing so fast is I was recently diagnosed with RP, so there's a bit of pressure as I may not be able to write later," she explains. But like everything else in her life, Jen's attitude about her disease is very optimistic. "Right now I'm lucky because it's slowly happening, so it could be a lot worse." Despite her recent diagnosis, Jennifer has no plans of slowing down. She recently released Opposition, book #5 in her hugely popular paranormal series Lux, on August 5th, Stay With Me, the third book in the Wait For You series comes out September 23rd, Stone Cold Touch, book #2 in the Dark Elements series comes out of October 28th, and she also has the first book in a brand new paranormal series titled Wicked coming out December 8th. "I think I'm always going to be a paranormal girl at heart," she says while talking about Wicked. "I'm always going to be intrigued by it." With every book Jennifer releases she seems to gain even more fans - many of whom express their love for her work by creating fan art, fan fiction, and tweeting like crazy about her characters. But even with all the success, Jennifer is still stunned by her fan base and doesn't take any of it for granted. "I think it's really surreal. I don't think with any book you get used to people falling in love with the story," she says. "It's been incredible just to realize your books are being read. It's a pretty amazing feeling."